Paramagnetism: Live raw food benefits your body's electrical field simply because it still has it's own paramagnetic field. 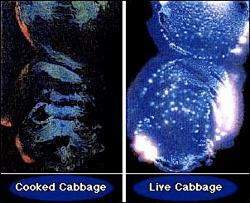 Kirlian photography is one way that this has been demonstrated (thanks to Christian Joubert for the kirlian photograph of cabbage from his site www.esseniaecovillage.com). Live foods add a paramagnetic charge to your body, thus increasing the radiance of your vital life force. Nobel Prize winner Dr. Fritz Popp discovered that humans retain, absorb and emit photons (light energy). 97% of human DNA has also been shown to give off photons. You absorb the photons from food to fuel your bio-electric field. Cooked food literally requires your body to fill the dead matter with photons so that it can be assimilated, thus weakening your body.